Although it is 7500km from Paris, St.-Laurent du Maroni has a distinctively European flavor. We hired Frank (from Holland but 6 years living in Suriname) to help us get around. He picked us up at Waterland at 0700 and drove us the 2 hours to Albina on a new paved road. The old road was destroyed in the late 1980’s-1990’s during the Maroon rebellions. After traveling about an hour, we passed by the last power line and entered a area of Suriname inhabited largely by Maroons living without electricity and a few other modern conveniences. Once in Albina, we knew we’d arrived at the equivalent of the wild west. 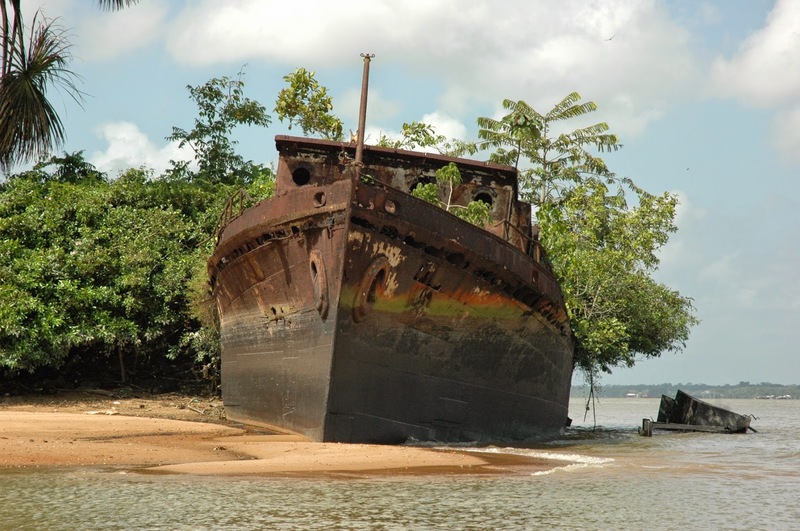 Albina serves as a base for nomadic, illegal gold prospectors and as a place to catch a boat ride across the Marowijne (Maroni) River to French Guiana. 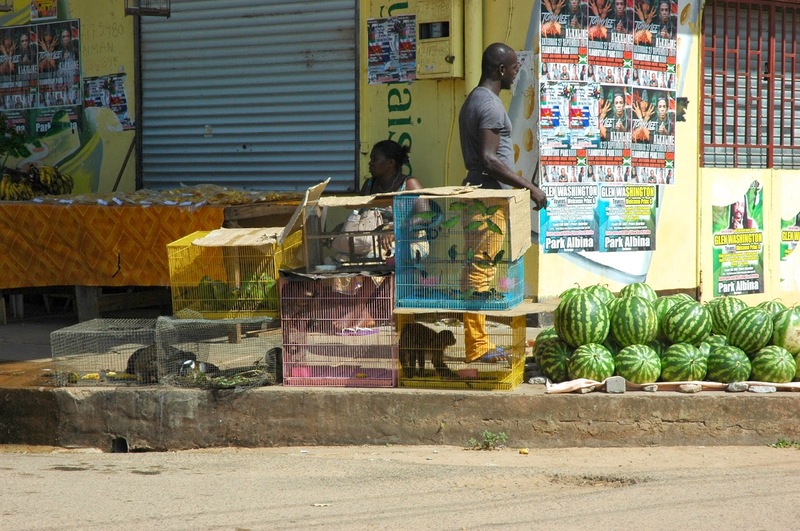 Chinese grocery shops, vegetable stands, vendors selling handmade jewelry, baskets, bird cages, monkeys, macaws, and assorted illegal items line the street. 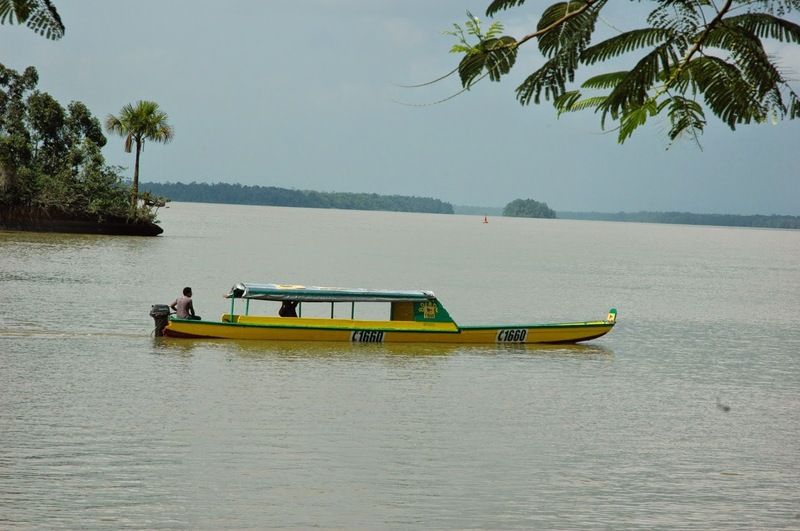 It is possible to take a ferry across the river and legally pass through immigration or you can hire a pirogue (small wooden boat) to transport you across. We chose the latter. In preparation for our day-trip, we watched the classic movie with Steve McQuean and Dustin Hoffman, Papillion knowing we would tour what remains of the penal colony once known at the worst place on Earth. 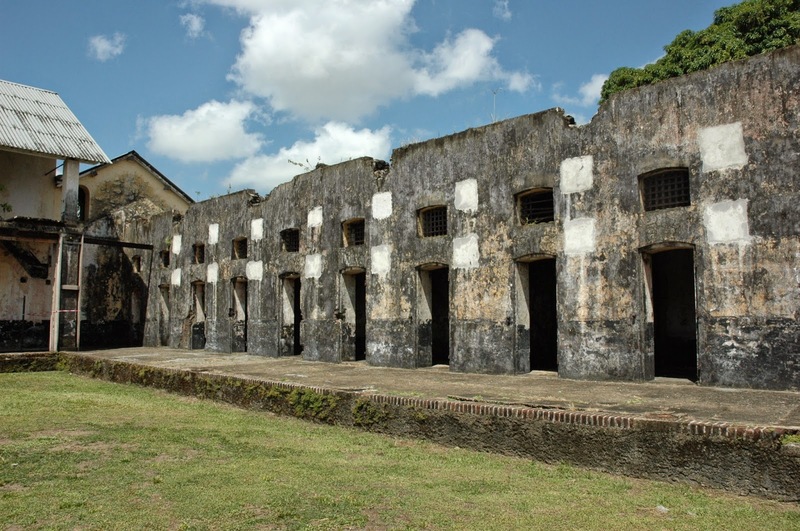 From 1852 to 1946 prisoners suffered a living death known as the “dry guillotine” in French Guiana. 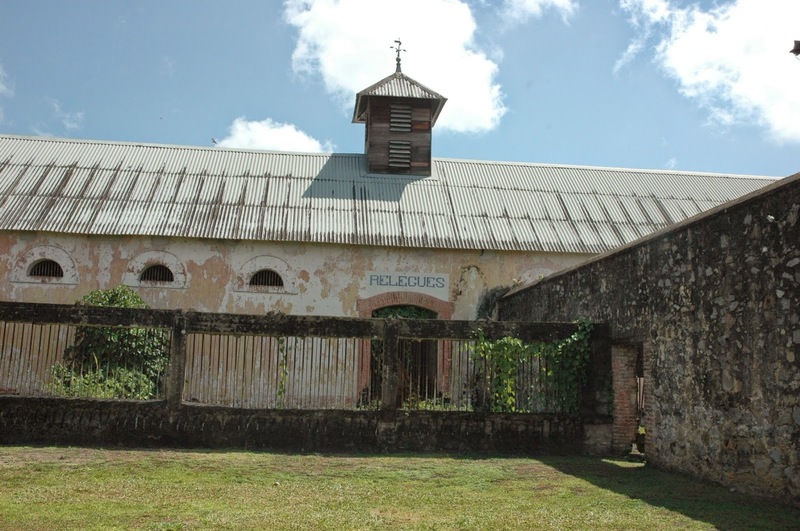 Three islands collectively known as the Iles du Salut, including infamous Devil’s Island, were a place no Frenchman would go unless sentenced by a judge. We visited the mainland facility where prisoners arrived from Marseilles after 15-days crammed in steel cages below decks. 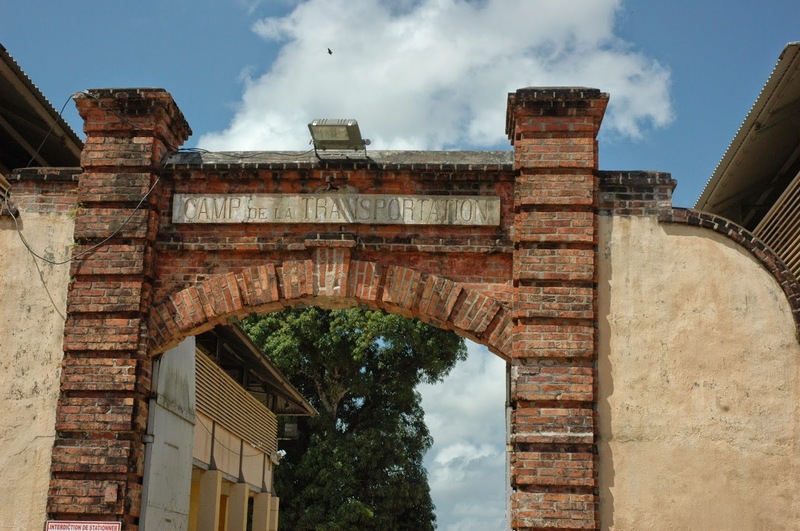 We entered through the impressive brick entrance to the Camp de Transportation and into the vast parade grounds where the commandant would address the naked new arrivals. 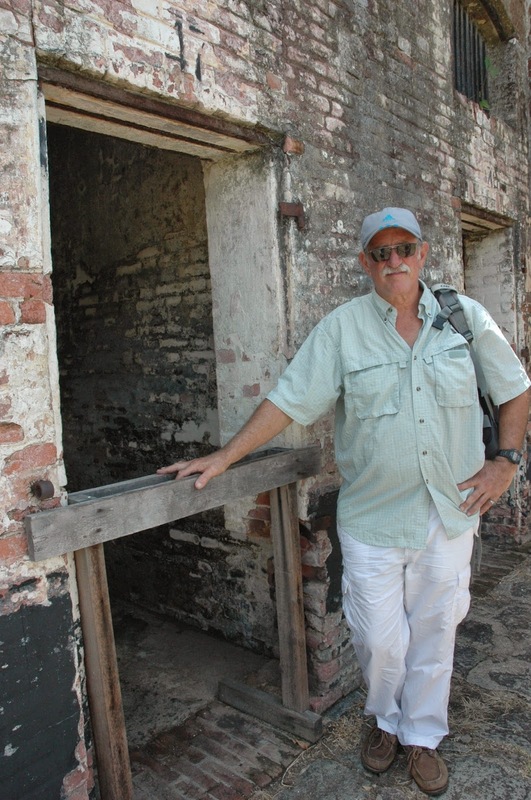 On the parade grounds we passed by the concrete foundation that once supported the guillotine used for all executions. 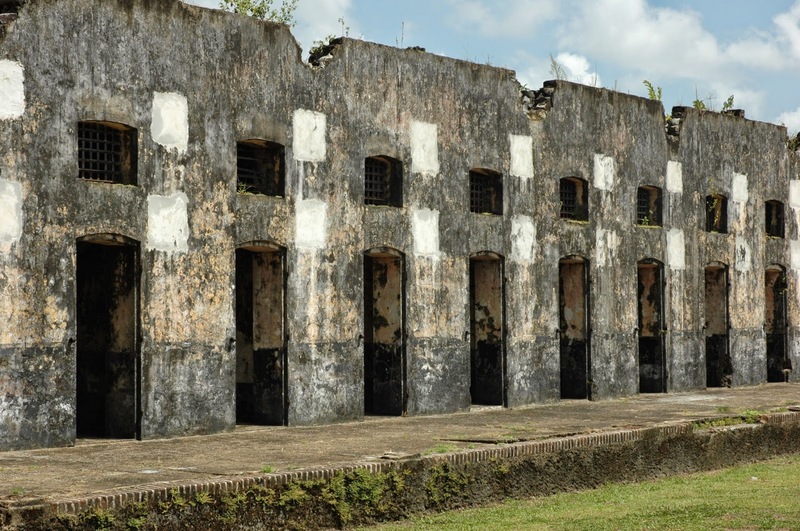 Prisoners were lined up on the parade ground and forced to view the executions; if they looked down, they were punished. The executioner was a volunteer convict who received a “premium” for each execution. 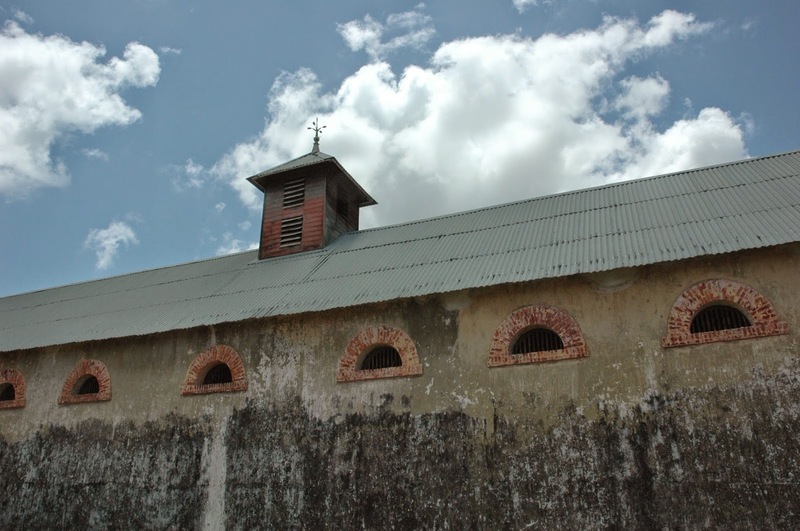 The condemned man was provided a last meal, a glass of rum, a liter of wine, and a cigarette; then he was required to sign a release from prison. 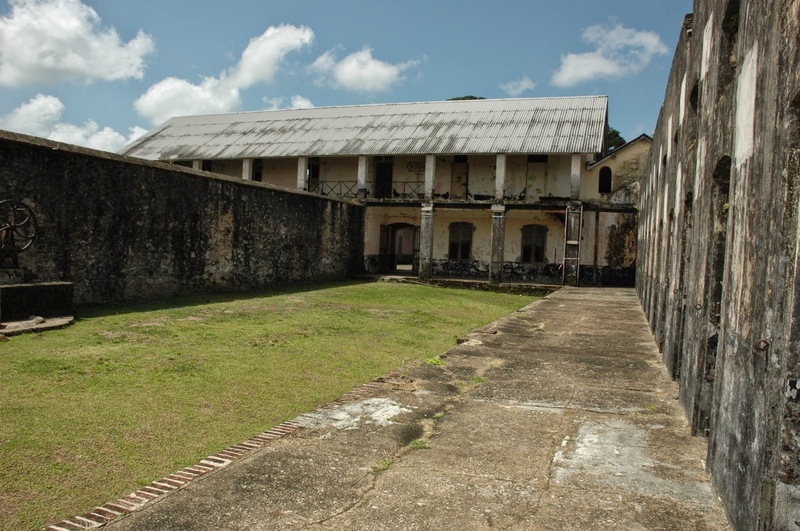 Buildings still standing include administration offices, the infirmary, and housing for the guards. We visited the cell block where a prisoners wearing red and white striped pajamas were confined to a room with a fixed wooden bench for a bed, a wooden pillow, one bucket for water and one for a toilet, and shackles to be placed around their ankles either overnight or for 22 out of 24 hours depending on their crime. 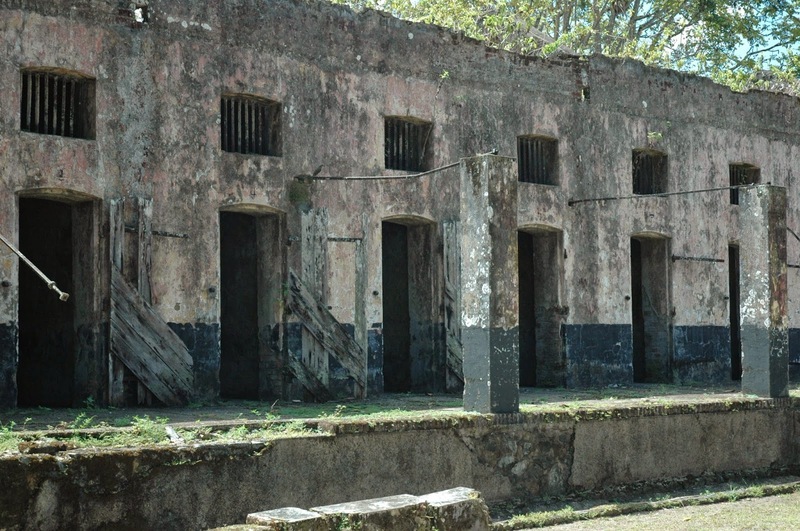 There were 12 cells for reserved for prisoners awaiting the death sentence and 20 cells reserved for those destined for Devil’s Island. Still visible in some cells, are marks on the walls made by prisoners including tallys marking off the numbers of days spent in the cell or drawings of their escape dreams. 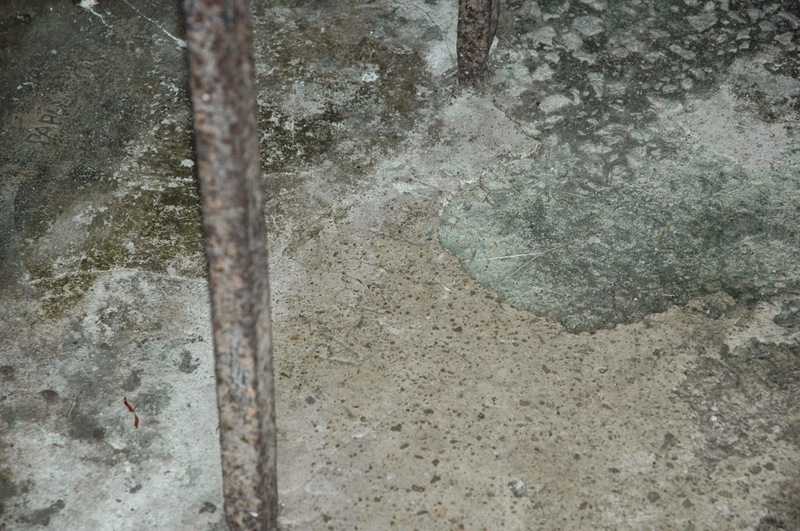 The bottom half of most of the prison walls, including cells, were covered in paint made from black ashes. If a prisoner touched a wall or leaned against it, black soot rubbed off on their hands or clothing resulting in punishment. 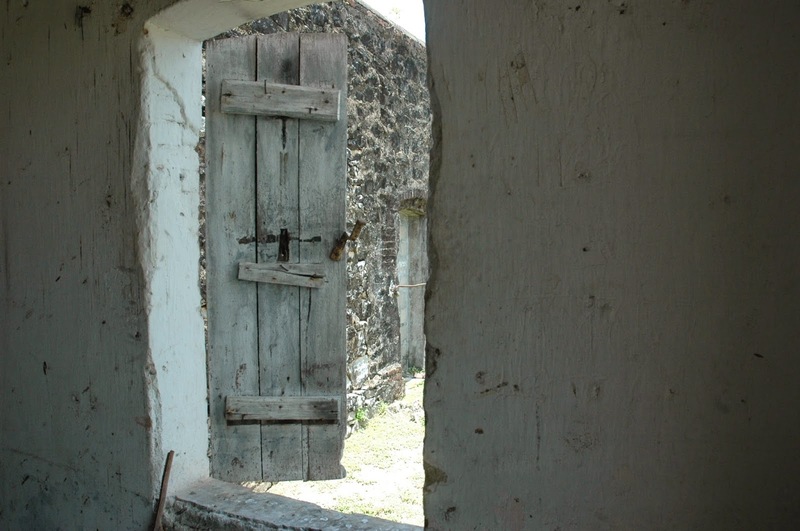 The forger, Fredric La Grange, tells how prisoners in solitary lay on their wooden boards, “their legs fettered to an iron bar, staring at any light coming from a small hole, just waiting… waiting… waiting.” La Grange died in 1964. Our guide shackled Tony (a prison warden in his previous life in England) to one of these beds for only 5 minutes but marks on his ankles remained for several hours. Of the 70,000+ convicts that sweated, suffered, and starved in the name of French justice, less than 2,000 would get out alive. 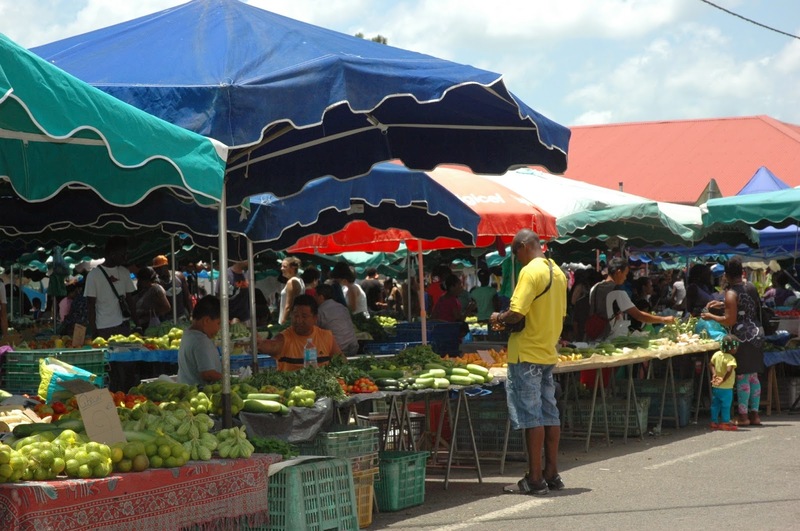 On a more uplifting note, we also spent time at a most fabulous outdoor market held Wednesdays and Saturdays. 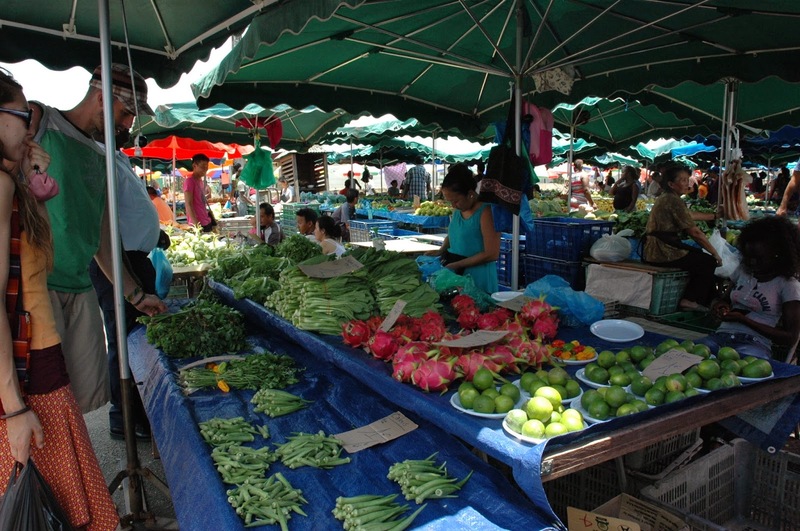 The fruits and veggies were fresh, clean, and attractively arranged on table after table all along the street. We ventured to Le Toucan for a lunch of salad and beer. 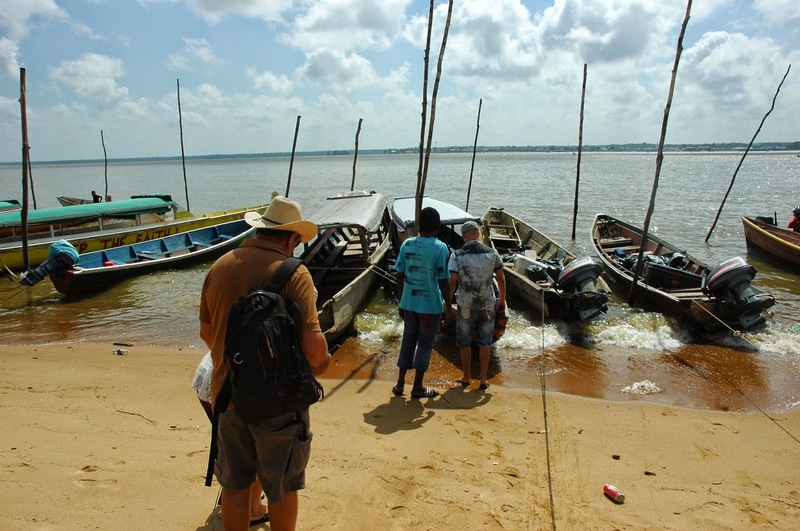 Too quickly, it was time to cross the river back to Suriname for the 2-hour drive back to Waterland.